Update: A reference implementation of Rin is now available online. Update: Rules are rewritten to clarify certain points. Thanks to Wei-Hwa Huang for reviewing the draft. Update: Omar Syed has written and kindly released a zillions-of-games rule file for Rin. Update: Rin is entered in the Thousand-Year Game Design Challenge. 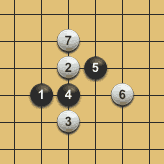 Rin (as known as 环棋, 環棋, リング ゲーム) is a two-player abstract strategy game played on a 16×16 grid with 256 intersection points. fig. 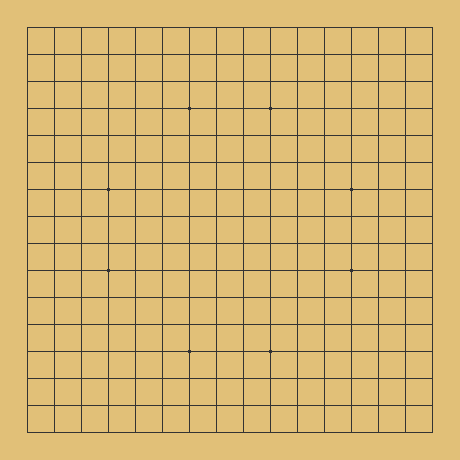 0 - A Rin board. The two players are conventionally called Black and White; each player has an unlimited number of playing stones in his color. Players take turns placing their own stones on the board and surrounding territory with rings. The object of the game is to have the most territory (and hence most stones) on the board when the board is full. Black takes the first turn of the game. From then on, each player takes two turns in succession before the other player moves; hence, the turn order is B-W-W-B-B-W-W-B-B-..., etc. 1. The player puts one stone of his own color on any unoccupied intersection point. 2. The player fills in any ring that he has just made (explained below). fig. 1 - An example of opening moves. The set of 60 intersection points along the four edges of the board (including the four corners) is called the safe zone. A stone that can trace a path along grid lines to the safe zone, only going through empty intersection points or stones of its own color, is alive. Any stone in the safe zone or connected to the safe zone through just stones of its own color is not only alive, but immune; non-immune stones can potentially be captured by the opponent. fig. 2 - An example of a corner situation where all stones are alive. A, B, E, I are all situated in the safe zone (and therefore immune) while G, J, K, N can reach the safe zone via G-C, J-F-G-C, K-L-H-D/K-O-N-M, and N-M, respectively. A player makes a ring when he creates a group of stones that surround at least one vacant point or an enemy stone, in such a way so that any enemy stones in the ring are no longer alive. All enclosed enemy stones, if any, are immediately killed and removed from the board; then all points inside the ring are immediately filled by stones of the same color as the ring. fig. 3 - An example of a black ring. 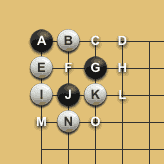 In the previous example, if it's Black's turn to play, Black can place two stones at L and O to form a ring G-J-O-L that surrounds the white stone at K, which is immediately killed and replaced by a black stone. fig. 4 - An example of a white ring. In the same example, if it's White's turn to play, White can place two stones at C and H to form a large ring, B-C-H-K-N-I-E, that fully encloses the vacant point F plus two black stones at G and J, all of which are immediately taken by White. The game ends when the entire board is filled. At that point, the winner is the player who has the most stones on the board. A Rin game may also end in a draw if each player controls 128 points. Point coordinates consist of a row number (increasing from top to bottom) and a column number (increasing from left to right), both zero-based. The top left corner is therefore (0, 0). Eight points with strategic implications are marked with a small dot on the board: (3, 6), (3, 9), (6, 12), (9, 12), (12, 9), (12, 6), (9, 3), (6, 3). Markers do not affect the gameplay. Passing is not allowed (and not useful anyway). Rin was designed by Zhen Wang in 2010. The text and images of this page are available for modification and reuse under the terms of the Creative Commons Attribution-Sharealike 3.0 Unported License. This game is one of the most elegant I've ever played, both in simplicity and strategy. Can it be played in a smaller board or a 16x16 board is fundamental for your design? It must be played in a even sized board (like 10x10 or 12x12) or can also be played in an odd sized board (like 11x11 or 13x13)? @Carlos: You can of course play Rin on smaller or larger boards; I consider 16x16 a sweet spot that makes the game interesting yet not tedious. That is an intentional design choice. I prefer a Tengen-less board where there's no obvious place (the central point) to play the first move; I also like the theoretical possibility of a draw, which is frowned upon and avoided by some game designers but I think deserves more love as nebulous draws can contribute to the drama of the game. And why 16x16 exactly? Because powers of two are my favorite even numbers, and those smaller or greater than 16 make Rin less interesting, at least for human players.